I didn't mention that since I clicked on it and it said " citation needed". And the sections are now deleted. There's absolutely no evidence substantiating this. The EGE wrote: And the sections are now deleted. There's absolutely no evidence substantiating this. Not when I'm in town. The EGE wrote: Not when I'm in town. I do remember the 'Fenway' station formerly being called 'Fenway Park' on both printed maps and on the station signs. Seriously, though, I'm slowly going through the MBTA system rewriting each station and line article. Complete historical details, fully cited, etc. Look at the Auburndale or Porter articles for examples. I'll get around to Eliot and Waban soon enough, and I'll let you know if I find anything to substantiate the story. The EGE wrote: Seriously, though, I'm slowly going through the MBTA system rewriting each station and line article. Complete historical details, fully cited, etc. Look at the Auburndale or Porter articles for examples. I'll get around to Eliot and Waban soon enough, and I'll let you know if I find anything to substantiate the story. If I can help you at all please let me know. I would love to put my library skills to work. I'll be sure to, thanks! Ninety percent of what I do is based off a few sources - the 2010 Bluebook, the NETRansit 1964-present history, and three books, plus old maps from Ward Maps. The obscure sources are the tricky ones - I may PM you this weekend about a different quote. Ege, u do a good job at getting the complete history of stations. It nice to see what they looked like and what RR they served. Tom Humphrey sent me some info about this. Waban is named after a local Indian chief, and Eliot after Rev. John Eliot, who converted Waban and others of his tribe to Christianity (Elliot St is named after a different person entirely). The story of the station names being transposed was first reported in a book published in 1944 called "Waban Early Days", which was a collection of essays by various people relating the history of Waban. Unfortunately for historians, much of it is stories handed down through families, with little actual evidence to back it up. 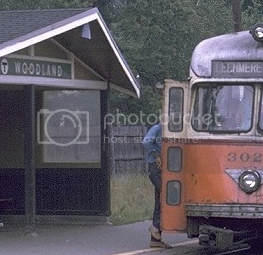 "Waban Early Days" has two accounts relating changes in the station names. One claims that Waban and Eliot were originally to be named Hillside and Waban, respectively, but just before the line opened several of the area's residents convinced the railroad to change the names, necessitating a reprinting of the schedules. Another version is the one which has been previously mentioned in this thread, that the railroad got the names mixed up (with the added detail that the original landowner had picked the names) and refused to change them to avoid printing new schedules. Newspaper accounts from when the line was opened make no mention of the station names being transposed, only that they were the same as they are today. It would seem that the only way to shed light on this matter would be to find letters between the B&A and the residents mentioned in "Waban Early Days" as being involved in choosing the station names. Many thanks to you and Tom, MBTA3247. I'll have to track down that collection when I get around to Eliot and Waban. Newton Town Hall should have that information tucked away someplace.